Bits and Pieces...: Studio Calico Giveaway! 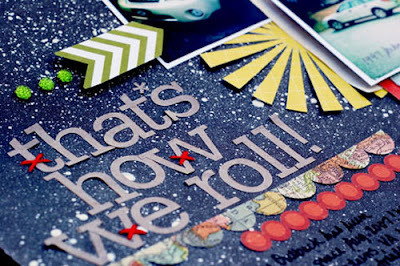 March's Main kit at Studio Calico is filled with lots of Crate Storyteller papers as well as the border stickers. I was really excited to break it open and create a couple of pages. The mix of patterns and colors were awesome! And I loved the date stamp that came with it. I'll be using that one over and over for sure. This first page is about one of our favorite parks. We love going up there with our friends and hiking all around. I used the papers to create the layered banner below the photos. Foam adhesive is definitely one of my best scrappy friends these days! I matted the photos with some vintage papers that came with the kit. And I even used one of the post cards they included with an ad for their new lines. See that cute polka dot design? That's it! I had so much fun with this one!! My next page is kind of a play on words. I was in step class one day singing along with the Miley Cyrus song (forget what it's called - something about a Hoe Down?...) Anyway, she said 'That's how we roll.' And I thought 'Aha- that's what I'll call my layout about my car! (Yeah, I know, it's pretty pathetic that I'm thinking about scrapping while I work out!) I used the Storyteller paper on here, too. Anyway, the Studio Calico stickers were perfect to create the title. I love the dark grey paper and decided to try and make it look like asphalt - you know to go with the whole car and driver theme. I used my white Mr. Huey and spritzed it all over the page. I created the borders by cutting the stickers into smaller pieces and stitching them together. 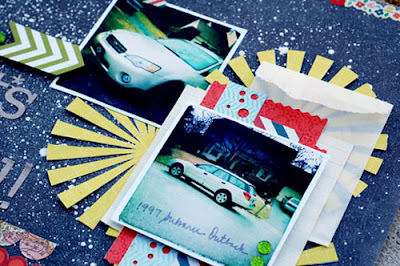 The sunbursts behind the photos were cut with my Silhouette and I layered more Storyteller papers behind the pics, too. I even used the glassine envelope that the Amy Tangerine flowers from the kit arrived in. I really had a lot of fun with this kit! And the best part is I still have a ton of stuff left over. I'm definitely going to crank out a few more things with it. So. Now for the fun part for YOU! 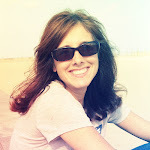 I have a $10 Studio Calico gift certificate to give away. Just leave me a comment by midnight on Sunday, March 18 on this post and you'll be entered to win. Be sure to include your email address! Also, if you'd like to win the entire kit, head over to the Crate Blog. Details are there for how you can do it! I love the second layout. It's so beautiful with the kraft letters and the white mist-LOVE!!! Love your layouts :)I love all the bright colours! Love your layouts! The colors are great! I pinned your car layout! I recently got a "new to me" van and I think your design is perfect to tell that story. 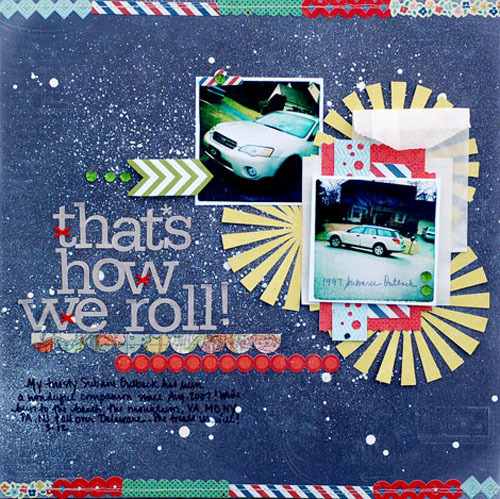 I love the background to the 'that's how we roll' LO. love what you did with the kit! thanks for the chance to win! Love what you've done with the kit! Especially the second lo looks great! Love that little cluster under the photo of your car! So awesome. Love that little cluster under one of the car photos! So awesome. I love your layouts! So fun! Thanks for a chance! Your LOs are beautiful. Especially love your confetti strip. The white mist looks amazing on that dark paper! Love how you cut out those green and white chevrons! Great idea. Fab layouts! 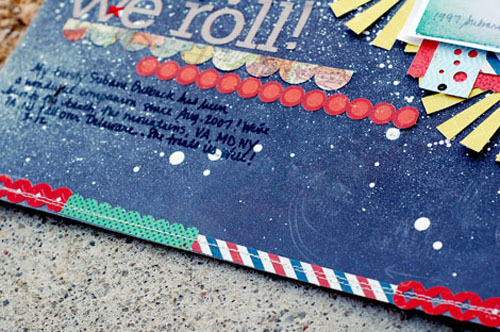 What a great idea with that confetti border! I have to scraplift that idea! Tfs! And thanks for the chance to win that GC! LOVE the colors of your layouts so much fun.Making me want to get up & get scrappy! that confetti pocket makes me swoon! I adore your layouts! The confetti pocket across the middle of the page is so fun, but not too much...perfect. Will be trying that technique out soon! I love your layouts! The colours are fabulous! Gorgeous layouts! Especially like how you made the asphalt look...very cool! Anabelle I love both pages, but the first one is so much like me and my pictures will fit very well in those patterns of Studio Calico. Tks for showing yuour talent. Love the bright colors of your layouts! I am getting a grandson(my first) and I am loving seeing these colorful layouts and thanks for the chance to win! I LOVE your layouts! the stitching, layers misting - so fun! i Love the first page especially...so bright and happy. and the confetti border? genius of an idea! thanks!!! Those are both awesome layouts! I admit that I was not real inspired by this kit at first, but after seeing what can be done with it I am ready to bust it out! 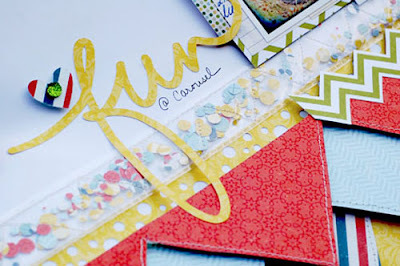 Love your confetti pocket - that is on my list of things to try, too! Love all the color on your pages! 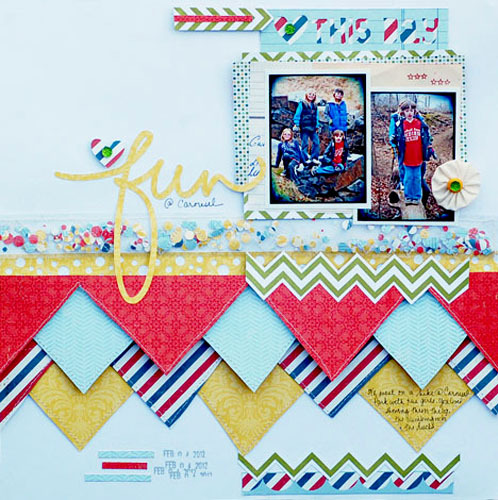 What fun layouts! This is my first time visiting your blog and I must make sure to visit more often! Love the white mist on the 2nd layout too! Gotta get me one of those! Love all your layouts - so bright and colorful. But the asphalt layout is my fave!! Thanks for sharing all your details behind the details as well. love love love both of your layouts! 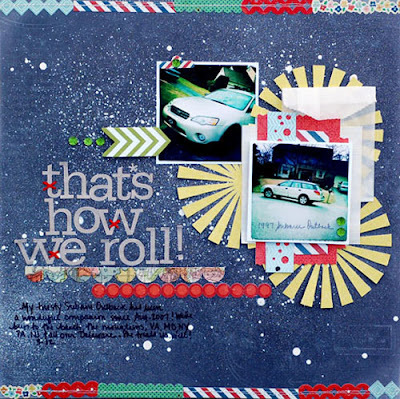 especially the "this is how we roll" title because I say that all the time! 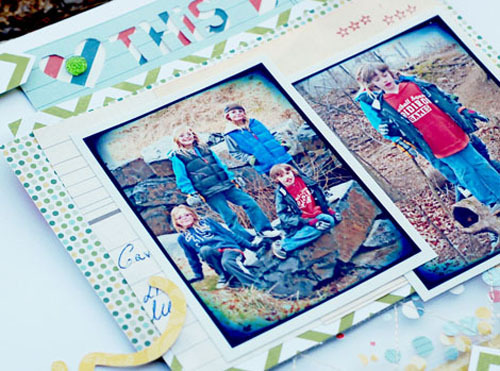 great pages - LOVE the confetti pocket and layering on the first. Gorgeous work! Love the fun, bright colors and the splashes of mist! Fantastic! Thank you for the chance to win! My email is purplecrystal84[at]hotmail[dot]com. Thanks!! Fabulous pages. Love the one with the car especially. I absolutely love what you did with the kit! Thanks for the chance! Love your layouts. Love the techniques! Love your layouts Anabelle! OK, so by any chance is the step class you take a BodyStep class? In a past release we used the Hoedown Throwdown as a speed step track. Love that one! Too much fun & I think about scrapping when I workout, and I'm the instructor!!! Oooooo to the confetti pocket. I love that it's a border. I haven't seen that idea before. LOVE your layouts....got tons of inspiration from the different things you did on them. I love to use the postcards too - they're too pretty to throw away! your pages are really incredible!!! thanks for a chance to win!! both those pages are fantastic but I really love that confetti strip! thanks for the chance to win! Great layouts! Thanks for the chance to win! I love the stitching across your confetti homemade envelope... I may have lift that. Also excited to see those sunbursts on a LO, I just got it for my vaca pics. Thanks for the chance to win! love the layering on the first one. and the sunburst on the second one. Love me some Crate Paper!!!! Great job with your creations! you did a great job with both pages...love 'em. and I love the kit! Great layouts! Love all the colours. LOVE your layouts!!!! Seriously loving the confetti trend right now, and I love what you did with the zig zag and foam dots!! Also love the white Mr. Huey spray...totally awesome!!! WOW! And WOW again! Can't tell you enough how much I love these layouts! Especially the layered banners on the first one. What a brilliant idea! Amazing work! saw these on Pinterest---love them! the layers of the first one are amazing! gorgeous pages! thanks for the chance to win! Love these! Any chance you can post these to the member gallery so I (and others) can add them to our favorites? THANKS! Love the confetti strip. Thanks for explaining how you made it. Love that you used the paper you punched for the confetti as a border under it too. Thanks for a chance to win. Love your layouts! I have to try the confetti pocket. Such fun! Thanks for the chance to win. I love your layouts! The 1st one is so bright & cheery. Fab banner! Love the kraft with white mist on the second. 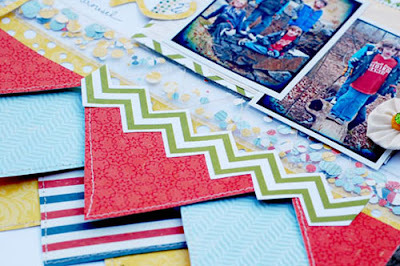 those layouts are fantastic girl - love all those colorful layers on your first layout! Your pages are so pretty!!! I love seeing what you did with this kit!! Beautiful layouts love the border on the first layout! Love your layers and the way you did the stickers, so cool looking. And of course love the confetti! Beautiful. Thank you for the chance to win. Oh, my heart Annabelle! SO super cute. What a blessing to have a chance to win. Thanks for your inspiration. I love your layouts, with all the different shapes and borders! And thanks for the chance to win! I love your layouts! I'm a new follower! I love how you created the ashphalt look with the white Mister Huey. Just genius!! All your pages are brilliant.